Shop online for 11 x-acto building supplies at discounts up to 70%. This is a 5½" 52 Tooth Per Inch Saw Blade from X-Acto. This is the Gripster Soft Grip Knife (Black) from X-Acto. This is the X-Acto Z Series #1 Knife with Cap. 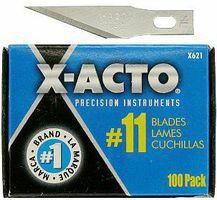 This is the X-ACTO Basic Knife Set.